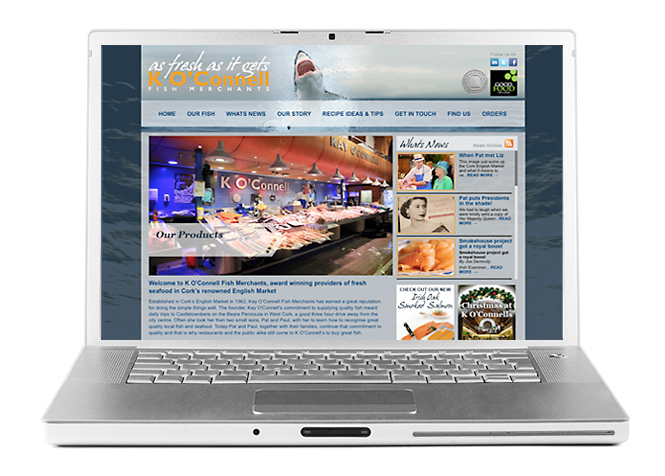 K O'Connell Fish Merchants are award winning providers of fresh seafood in Cork's renowned English Market. The finished website design is pictured here. The website was built with ExpressionEngine 'Content Management System', which allows the client to update the website themself. This includes a news feed into the site. News feeds, blogs, updates, Facebook and Twitter links are all great for keeping content fresh which Google loves and helps drive traffic to the site.